This year has seen the introduction of a new grading system for English and Maths GCSE results across England. Since Ofqual officially announced the new system would be introduced from 2017, staff at Allerton Grange have been busy preparing students for the new qualifications and translating what the changes mean for teaching and learning. The new grading structure is not directly equivalent to the old A* - G system, however grade 4 and above is equivalent to grade C and above, which is the widely accepted benchmark for further education providers and employers. Going forward, it will be more difficult to achieve the highest grade of 9, which now includes some work that has previously been taught at A Level. Following the new grading structure for English and Maths GCSEs, the results for Allerton Grange show rapid progress in student achievement for all abilities. Over the last twelve months, on average, students have improved by two full grades in English, and one and a half grades in Maths. Excellent outcomes have been achieved across all subjects in the Arts, including Art & Photography, Drama, Music and Technology. Languages have equally achieved well above national average results in French, German, Spanish and Urdu. Congratulations to George, Anna, Kiera and Niall, who all achieved the highest grade of 9 under the new grading system for English and Maths, along with a number of A* and A grades in other subjects. They are joining Allerton Grange Sixth Form and plan to study a range of A Level courses including Maths, Geography, Physics, Chemistry and Spanish. Our DAHIT (Deaf and Hearing Impairment Team) students also received pleasing results; Amaan scored five A*- C grades and Ese achieved top grades in all of her subjects, including As and a 7 in double Science and Maths respectively. Allerton Grange Schools’ Headteacher, Mr Mike Roper, said, “We are extremely pleased that, under the new grading system, our results show rapid progress for our students in both English and Maths. “Allerton Grange is a school that supports each individual student to achieve their full potential, no matter their ability level or starting point. Therefore, we welcome the new structure that focuses more on progress. Coun Imran Khan, Bradford Council's Executive Member for Education, Employment and Skills said: "The early signs from the provisional results we have so far are very encouraging with the majority of schools in the district seeing their grades improve this year. "We know that today's success is the culmination of years of hard work by our young people and the dedicated staff in schools across the district. "The indications we have from the results of 22 of the 28 secondary schools across Bradford district are certainly positive. The vast majority of these schools have seen their average A-level grades improve compared with last year. "There are also signs of strong success among students taking vocational and technical qualifications. "As the country's youngest city the success of our young people is crucial to the future of our district. I am very pleased to see these initial results are positive. I would like to congratulate Bradford students on their achievements and wish them the very best for their future." Students at The Grammar School at Leeds (GSAL) have won coveted places at leading universities with a string of top grades on A-level results day. Fahd Omar has a place to study economics at St John’s College, Cambridge, after achieving four straight A*s in biology, chemistry, maths and further maths. With A* in Latin and As in biology and French, Disha Anand is heading to Oxford to study law with French law at Brasenose College. Disha said: “I’m so happy to realise my goal of studying at Oxford. It will be a completely new experience unlike anything I’ve done before. Aditya Tambe and Dhaval Sethi, who received his results whilst away in India, achieved matching sets of four A*s in chemistry, physics, maths and further maths. Aditya has a place at Imperial College London for mechanical engineering and Dhaval has a place to study economics at University College London. A third of students at The Grammar School at Leeds (GSAL) achieved all their A-levels at A*or A grades. Sixty students celebrated top marks as they picked up their grades, with 16 scooping three or more straight A*s.
Of the 16 who swept the board with the top grade, five students achieved four A*s and a further 11 achieved three A*s.
Principal Sue Woodroofe said: “This is the first cohort of students to take the more rigorous reformed A-levels and I’m delighted that a third of our students achieved straight A*/A grades and three-quarters of grades were A*-B. In all, 54 per cent of the cohort achieved a minimum of ABB grades – the entry requirement of leading universities. 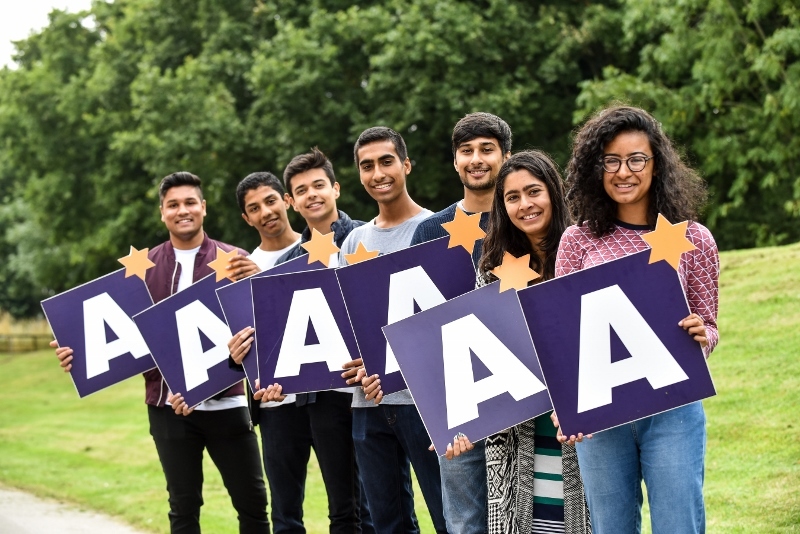 Thousands of students across the UK ripped open their precious envelopes on Thursday 18th August to unveil their highly anticipated A-level results. Amongst those celebrating was Grammar School at Leeds student, Shahzaib Ahmad. Having arrived in the UK at the tender age of 11 with only a few words of English, he has now secured a prestigious place at Cambridge University after achieving stellar A-Level results. To make the day even better, the results came out on Shahzaib’s 18th birthday. The gifted student will now go on to study medicine at St John’s College, Cambridge, after gaining four A*s in chemistry, biology, maths and French. 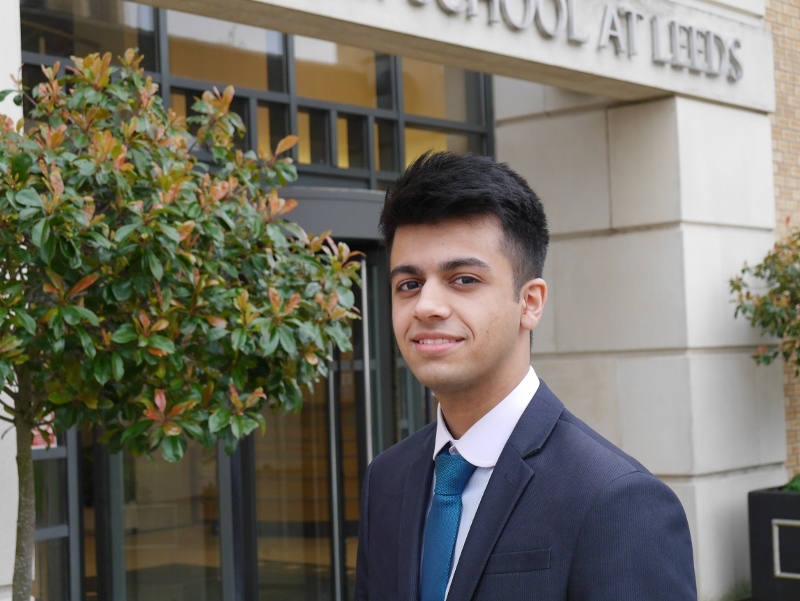 His impressive academic record, which includes 12 A*s in his GCSEs taken at Batley Grammar School, has been achieved despite having to adapt to a new language and culture when his family moved to the UK from Pakistan seven years ago. Shahzaib said: “It was daunting changing cultures and countries at such a young age, however being in school straight away helped me to pick up the language in about a year and a half. 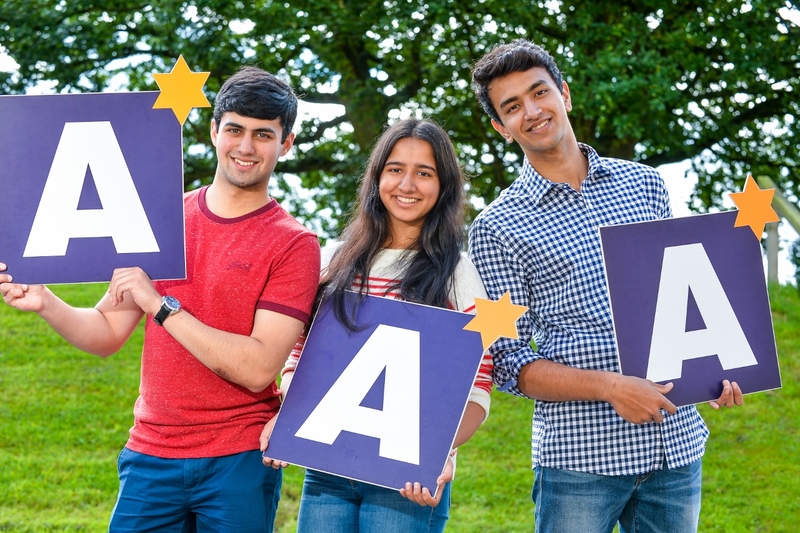 Shahzaib is one of 14 A-level students at GSAL who are celebrating a clean sweep of three or more A*s.
Of the 14 who gained the top grade, three students achieved four A*s, including Manjari Dhar, and a further 11 achieved three A*s.
Kaiser Lodhi, Adi Munot, Abhijeet Oswal and Miheer Sonwalkar are each celebrating three A*s and an A, while Aditi Rajgopal achieved three straight A* grades. At GSAL, 63 per cent of the cohort achieved a minimum of ABB grades – the entry requirement of leading universities. Nine students have their Oxbridge places confirmed. Principal Sue Woodroofe said: “These are tremendous results and we are very proud of every one of our students. 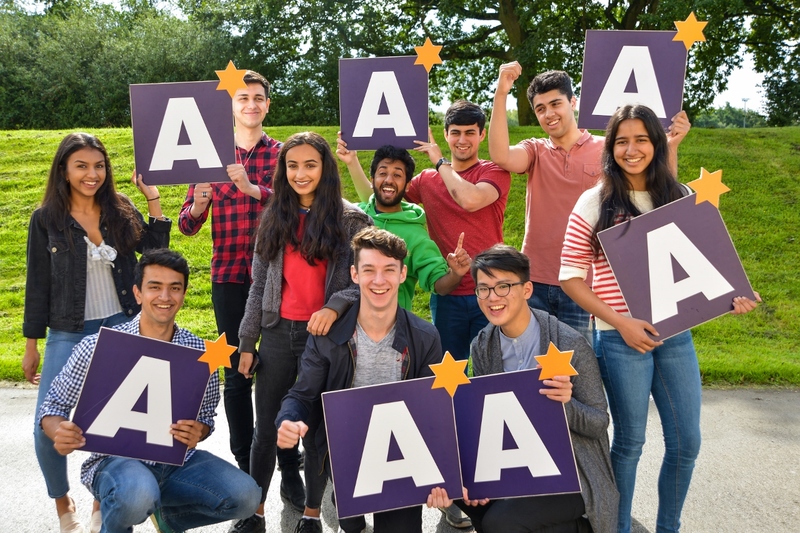 A-levels continue to be a hallmark of excellence around the world and, in achieving so well at this stage, we know that our students will go on to continued success at university and beyond. 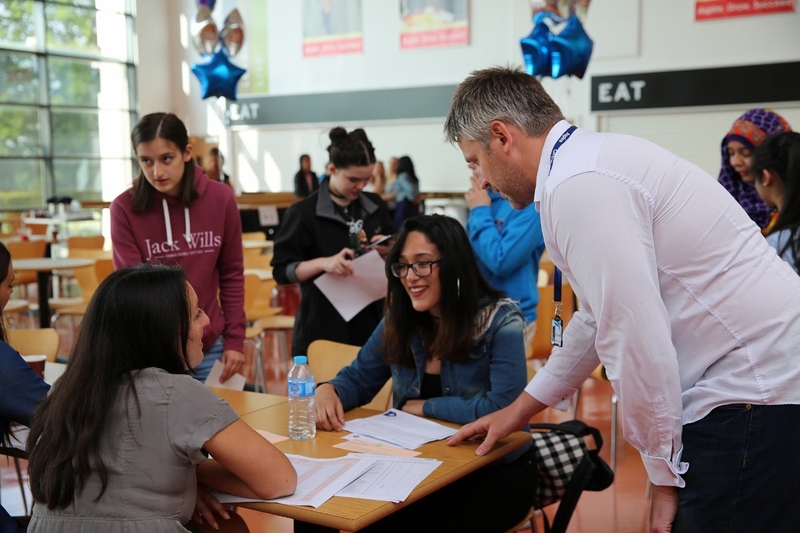 Elsewhere, celebrations were also seen in Bradford with students and staff at Bradford College Sixth Form ‘overjoyed’ after their A Level overall pass rate reached 96.1 per cent. The Sixth Form is also celebrating 97.6 per cent pass rates for English and Maths, which is a 3.3 per cent increase on last year. 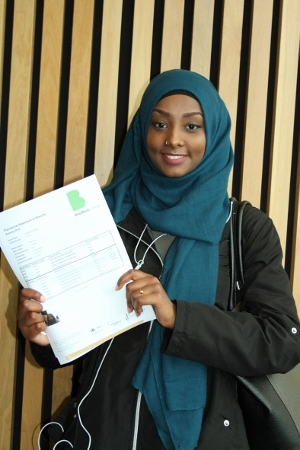 Amongst the high achievers was 20-year-old Hodan Abdi from Leeds, who secured her place at university to study business management after securing A Levels in Business Studies, Sociology and Anthropology. Congratulations to all students who received their A Level results last week and good luck with your futures.